Nico Ansom has got the game to go with his look. Nico Ansom nets a 3-pointer in a “best of five” contest at the Venice Beach, Calif., basketball courts. His opponent talks trash. The chorus from the bleachers makes bets. Amid this gust of hot air, Ansom is the only white guy here. “You play at Stanford?” an onlooker asks midstroke. Swish, 2 out of 5 . . .
“Where did you go to school then?” the man prods. “The Venice Beach School,” Ansom laughs. Swish, 3 out of 5 . . . The implication is clear: White players this good are NOT streetballers. Swish, 4 out of 5 . . .
Who is Nico Ansom? From the snapback hat down to the tribal print shorts, he is the real life Billy Hoyle, with a twist: He’s French. Nico Ansom in his hometown of Paris. Ansom is also the founder of the Venice Basketball League, an independent summer league hosted at the famous beachfront courts, which tips off June 7. In 1993, “White Men Can’t Jump” hit theaters, Woody Harrelson’s and Wesley Snipes’ characters became an overnight cultural phenomenon. “The first time I saw the movie as a kid, I tried to imitate all the moves. I wanted to live that life,” Ansom recalls. The film turned Venice Beach itself into an immortal character as well. Rucker Park in New York may be streetball’s Mecca, but Venice became the game’s paradise. On a night like this, the sunset over the ocean paints the sky with more colors than Ansom’s throwback Nikes rising through the air. When Ansom moved to the U.S. in 1998, “The first thing I did was come to Venice; ‘Who got next?’ were my first words in English.” He was 15. Despite being an outsider, Ansom proved worthy. He had a knack for winning games. He likes to think “the respect was instant, because I always played hard,” but he acknowledges, “I got punched a lot though.” Back then, LA’s gangs ruled the Venice sidelines. “I would get death threats; ‘Don’t go down a dark alley or you’ll get shanked.’ ” Even when winning was against his better judgment for risk of life and limb, he kept on winning. “Guys don’t want to lose to a French white guy,” he says and cracks a smile mischievously. They especially don’t want to get dunked on by that guy. If white men can’t jump, then Frog legs can’t hop, right? But Ansom defied the stereotypes. He relished every opportunity to throw down and drop jaws. Surely this kid was something special. Ansom’s hoop dreams in the organized game were short-lived. He was recruited by Fairfax High School, a top prep program in Los Angeles. He played there along with future pro players Craig Smith, Jamal Boykin and Josh Shipp, but Ansom graduated without any scholarship offers. He walked on at local Santa Monica College, but distractions off the court abruptly ended his college career. Naturally, Ansom failed to mention to his coach that he would be gone for an entire week. When he returned, he had been “automatically” cut from the team. Shortly after packing up his locker, he drove to Venice. “I thought this is where basketball belongs,” he said. Ansom had come home. Now a full-blown streetballer, he remixed his playing style in typical DJ fashion. “I put hot sauce, ketchup and mustard in the game, all the sauces . . . and onions if you want to make it French,” he jokes. He earned himself the nicknames “Jungle Boy” and “Nick the Quick,” while upping his street cred. He formed a funky crew to complement his persona, including: Mani Love, a 4-foot-5 phenom; Chris Staples, a Harlem Globetrotter; Ryan Pickering, a solar-panel farmer; and Tarron Williams, a junkyard owner in South Central LA. “By 2006, I had the best street team in the city,” Ansom proclaims. As Ansom’s stature grew, so did the comparison to Harrelson’s Billy Hoyle character in the streetball community. “The first time I met Nick, I thought he was just like Woody and everything,” says AJ “Chosen One” Harris. “Woody is his hero; he’s modeled his whole life after him . . . he even named his dog Woody,” Pickering remarks. Of course, he wouldn’t be Billy Hoyle incarnate without a little hustle. Best of five, one-on-one . . .
“I have over 60 victims and counting,” says Ansom, who regularly bets newcomers who assume he can’t play because of his look. “New booty,” he calls them. True to Harrelson’s character, Ansom is prone to making bigger bets even if he’s in over his head. In 2006, he went for broke and founded the Venice Basketball League, of which he is currently president. Ansom already had the right cast, Venice the stage, and an audience of 50,000 tourists passing by the courts each day. Over the years, the show has been widely noticed. The VBL caught the attention of big-name athletes such as Metta World Peace, Terrell Owens, and George Hill, all who laced up to play. “Pros get scared though because they could lose their reputation,” Ansom smirks. “Pros get exposed.” Each season he challenges more professionals to test their skills in Venice. Today, Ansom’s life continues to imitate art. The kid who wanted to be Billy Hoyle has become a Venice legend in his own right. Through his skills, personality and leadership of the VBL, Ansom has not only earned the respect he was denied when he first arrived on the scene, but also gained the trust of the community. If you’re a hoops fan, take a ride to Venice this summer and ask for Nick. You can’t miss, and neither can he. 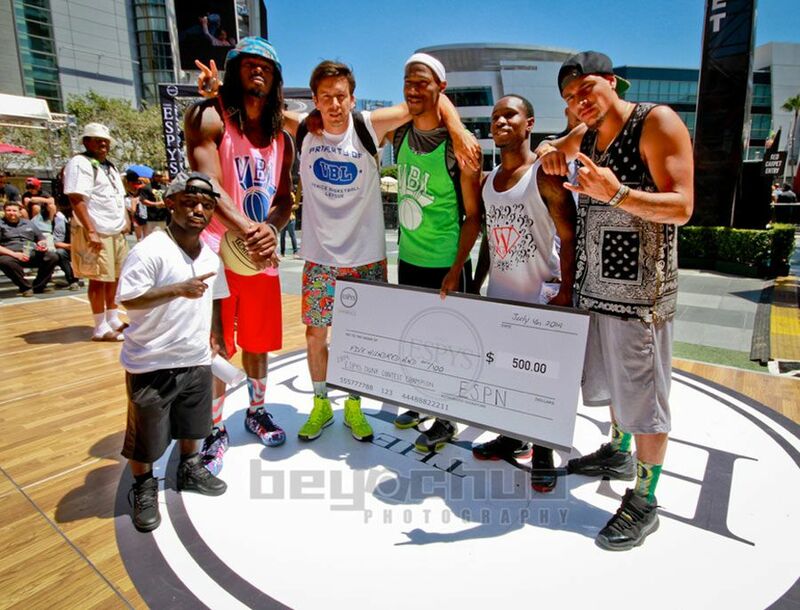 Nico Ansom and his streetballing crew.